This anthology of stories based on Robert W. Chambers' The King in Yellow has two crossover stories. 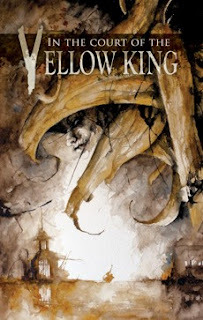 In William Meikle's "Bedlam in Yellow," Carnacki investigates strange happenings at Bethlem Asylum involving an inmate who read the titular play from Chambers' book, and finds himself transported to Carcosa, where he encounters the King in Yellow himself. In Pete Rawlik's "The Sepia Prints," a member of the security force for the American delegation to the Treaty of Versailles is on leave after an incident involving a strange estate on the outskirts of Paris and a disreputable doctor who, like him, is from Arkham. A woman gives the unnamed man a collection of photographs from the Paris Opera House’s 1899 production of The King in Yellow before committing suicide. Rumors about the opera being haunted came to a head in the early 1880s with the strange affair of the Opera Ghost. The man meets Moncharmin, the Opera’s librarian, who appeared in the play. The story’s unnamed narrator is Robert Peaslee from H.P. Lovecraft’s "The Shadow Out of Time." The disreputable doctor is Martial Canterel, the owner of the titular estate in Raymond Roussel’s novel Locus Solus. Peaslee encountered Canterel in Rawlik’s story "Revenge of the Reanimator." Arkham, Massachusetts is the setting of a number of Lovecraft’s Cthulhu Mythos stories. The Opera Ghost and Moncharmin are from Gaston Leroux’s novel The Phantom of the Opera.